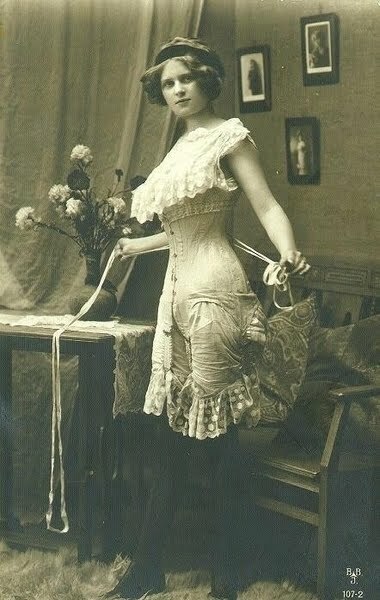 Lady Carolyn: Interpreting Edwardian Undergarments - Gad what a Chore! Wow, with the anniversary of the Titanic it seems like everyone is making a 1912 costume. All the posting and chattering on face book is what to wear under those beautiful 1912 ensembles, be it day dresses or evening wear. So I’ll throw my hat into the ring with some thoughts and pictures. And maybe muddy the waters a little more. The chattering I'm hearing about corsets - everyone pretty much agrees it is the long underbust corset. Not that ladies still didn't wear that favorite corset from a couple of years back. But it's what goes under or over the corset that has the chattering and picture sharing going around the web. I must admit I'm as curious as the next soul. Definitely something had to be worn under the corset. Why? Help keep the body oils, dirt, grim off the corset , a little padding and something else to pinch besides skin when cinching down. It would seem that it would be a chemise; we are very used to that from the early Edwardian and Victorian period. Then the drawers are worn, chemise sometimes tucked in or on outside. Next garment the corset. But now that most corset has garters attached. The drawers are shorter, chemise and all slightly bunches up to attach the stockings to the garter. The stockings do not come to the thigh, just a little above the knee. Notice how long the garters are. Looks like drawers to me. Where is the Chemise? Is that it tucked in, at top of her thigh? Dang, those are lonnng laces! Notice how long the garters are, stockings end above the knee not the thigh. It seems there would be the chemise, the corset, attach the stockings, then the combination drawers corset cover. 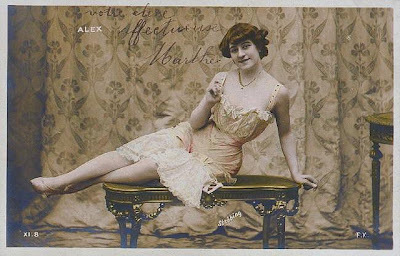 But in every catalogue picture there is no layering of- chemise, corset, stockings, then combination drawers corset cover. Then the princess slip or petticoats. And you can get these in a skirt or drawers. So were the drawers still there under the corset? and what did a skirt do? a mini slip? the lengths could be ordered as short as 24 in. Same page and they are the drawers, but could be ordered in a skirt. Could it have been possible that anyone used the combination under the corset to take the place of the chemise and drawers? I know the minds of teenage girls and younger women. I can bet some of my girls would have done something like this (I had lots of teen girls). Especially when they tout the newest rage is the short French drawers or skirt. I’m not saying this was the normal thing but I think I know they wanted a little freedom from layers and restriction. Why else talk about this newest short skirt or drawers and this is a 1908 Sear, Roebuck Catalogue. This is just a thought. Could this be a combination? and not a chemise and drawers? orrr could it be a corset cover under her corset and then wear regular drawers? could it be she has something like the FLUFFY RUFFLE CORSET COVER, ALL THE RAGE! on under the corset? I had actually posted tis whole thing and went back on Facebook and then in The Unsinkables, Solanah Cornell had the link to Catalogue of Corsets, New York Mail Order Company. "Thumbing" through I found this, looks like what our gal in the picture above has on. So now my question still would be -- is that, could it possibly be a Combination on under the corset? Granted the pictures above may have NOTHING to do with fashion, just some girls out having a little risque fun with the camera. And this may be why we get confused and waters get muddy. I have a pair of combinations and a princess slip they are from the estate of Robert Ring, here in Reno. Not that he wore them, but I bought from that estate. :) Notice in the front there are 3 buttons, very wide leg. The top has that pouter pigeon look if it rest at the waists. The back--- ooo la la! A little on the breezy side! But it does make it easy to take care of business. I added the pink ribbon. This is about a modern size 4/6. It fits me perfect although I do not wear it, but have modeled it for a few ladies as you will see why is last picture! This is not G rated when being worn. If the waist in front is pulled up to meet the level of the waist in back it is a pouter pigeon front. Down the sides of the legs. The breesy backside, open all the way to the waist. Now on to petticoats or slips. 1908 Sears and 1911 Macy's (by the way you can download this catalogue off the web free to your computer in PDF, send it to your Kindle or Nook in EPUB) show Princess slips or corset covers with the use of petticoats. I thought my princess slip was prettier that what it is, I think I was remembering the lace on the combination. Mine is very much like this picture out of the Macy's 1911 catalogue. But I did learn something when I modeled this. I thought it buttoned down the font. I put it on and it felt funny, didn't fit right. I turned it around and it fit great, just like the ones in the pictures above in the Macy's ad. I also added the pink ribbon. Notice the tucks at the waist, buttons down the back, v neck line in back. The way it bloused out on sides I thought it was for the bust area, but it does not fit if you try to button down the front and you don't get the smoothing under the clothes in front if buttons are there. The estate the combination and princess slip came from. Really it looks beautiful as to how the ancient women were using their clothes. It is very important to select good quality clothes so that problems like skin rashes may not happen and special care should be taken while purchasing undergarments and bras.